Alderlsey High School is a fully inclusive mainstream Academy situated in Wolverhampton, it is part of the Amethyst Academy Trust. At Aldersley High School, all students are valued equally, regardless of where their abilities lie, with the Academy being committed to “providing our students with the best life chances”. All students are entitled to have access to a broad, balanced and relevant curriculum, which is differentiated to meet individual needs. Within its aims, Aldersley High School is committed to equal opportunities, with students being encouraged to achieve their full potential, whatever their academic or physical ability, through the provision of a balanced and challenging curriculum in both content and styles of learning. Be treated as individuals where their individual needs, interests and aptitudes are recognised. Be entitled to have an emerging or evident special educational need identified and assessed. Be provided with opportunities for continued growth and development so that they can increase their self-esteem and become confident. Receive a balanced curriculum in both content and style of delivery which allow them to make informed choices as they progress beyond the Academy. Be encouraged to achieve their full potential, whatever their abilities. Learn to take an increasing responsibility for their own learning and actions so that they will be equipped to deal with life after school. Be encouraged to see education as a life-long process to the benefit of all aspects of their life. What kinds of SEND do students have in your school? Children are identified as having SEND when they have a significantly greater difficulty in learning than the majority of children the same age or have a disability which prevents or hinders them from making use of education facilities of a kind generally provided for children of the same age in schools within the area of the Local Authority (SEND Regulations 2014). 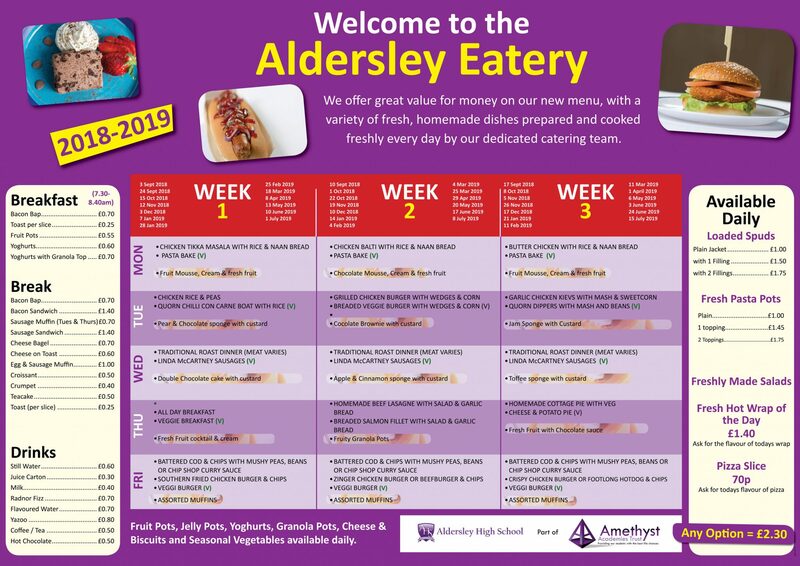 Students at Aldersley High School have a range of needs including Communication and Interaction; Cognition and Learning; Social, Emotional and Mental Health difficulties and Sensory or Physical difficulties. We have a Speech and Language Resource base whereby we ensure students with specific Speech and Language needs are catered for. How do you know if a pupil needs extra help? When your child first joins Aldersley High School, we use information from a range of sources to help identify SEND and other needs. These include information from parents/carers; primary school teachers; end of key stage 2 levels; base line testing; literacy and numeracy tests; application form information; subject teachers; specialist colleagues and external agencies. Our class teachers, SENCo, Senior Leadership team (SLT), Heads of Department (CTLs) and Achievement and Standard Leaders (ASLs) closely monitor the progress and attainment of all students, including those who have or may have SEND after each data capture. The continuous monitoring of students during their time at Aldersley High School will further identify students with a special educational need. This identification may come from tutors, subject teachers, support colleagues, Pastoral Heads of Year, Outside agencies, parents/carers or the students themselves. If your child needs to be assessed we would use a range of assessments depending on the area of need. If it is thought a family needs support, we have good working relationships with outside agencies and a referral can be made to them. We follow a staged and graduated approach to identifying and assessing needs, using the ‘Assess, Plan, Do, Review’ model. The triggers for intervention could be the teacher’s, support colleague’s or others concern, underpinned by evidence, about a pupil who, despite receiving differentiated learning opportunities, does make expected progress. All students with SEND are on the SEND or Additional Needs registers which are accessible to all staff. Staff use this information to inform their lesson planning, teaching and student learning activities. Targeted interventions are planned and delivered where appropriate. This may include small group or individual work across a broad range of activities. All students, including those with SEND, are assessed on a regular basis, in accordance with the Academy’s Assessment Policy. Teachers formally assess and review progress and attainment between 3 and 5 times a year, depending on year group, which is communicated to parents/carers by an ROP or report that is sent home. Additionally, parents evenings are held twice a year when there is an opportunity to discuss progress, attainment and next steps. All students with a Statement or Education, Health & Care Plan have an Annual Review. SEND students who are on the SEND register will also have a termly review. The school has a Quality Assurance process that assesses the effectiveness of Teaching and Learning for all students, including those with SEND and the outcomes of these evaluations are used to create and implement development plans for all aspects of school life. These are regularly reviewed through regular evaluation. Additionally progress and attainment data for students is analysed for effectiveness and value for money. How do you check and review the progress of my child and how will I be involved? The school will send home between 3 and 5 reports each time a year, depending on year group, which will show your child’s current and target levels as well as reporting on their effort, behaviour and ability to meet deadlines. SENCo, SLT, CTLs and RSLs and Inclusion staff will monitor and review your child’s levels and pick up on any subjects where your child is not making the right amount of progress. We will then put an intervention in place. At the next reporting time we will check whether the right progress has been made. We give reports to the governors who check and review the work of all departments, including SEND. We welcome the involvement of parents/carers and want to keep you up to date and involved with your child’s progress. We do this through parents evening; email; telephone calls; appointments made with individual teachers; Annual Reviews/termly reviews (for those on the SEND register). The school provides information for parents through newsletters; information on the website and VLE; Open/Information days; Parents Evenings and letters home. Learning Plans are made available to parents termly. How do teachers help students with SEND? Our teachers have high expectations of all students, including those with SEND. All teachers will be told about your child’s individual needs and will adapt their lessons to meet these requirements. Teachers have experience and/or are trained in doing this. This may involve using different strategies, more practical/adaptation of resources and activities. This means your child can access the lessons fully. Within school there are a variety of staff roles to help us fully support your child. Where it is felt it is the right thing to do a student may be offered additional help and support, in which case you would be informed. There are a range of interventions and additional subject support which are available and should your child need this, it would be discussed with you. When your child is approaching the start of Key Stage 4, if we think it is needed, we will assess and apply for exam Access Arrangements according to the Joint Council for Qualifications exam regulations. Most of our students follow a traditional curriculum, however a small number of learners have a more personalised curriculum to match their individual needs, interests and abilities. This may include option choices; additional literacy; nurture groups; intervention groups and number of qualifications studied. Our school is a safe and accessible building and we do our best to make it welcoming to the whole community. All safeguarding procedures and risk assessments are in place and adhered to by all staff. We have a range of different facilities to help SEND students throughout our school including a lift to access all areas; disabled toilets; ramps; wide corridors and equipment to help with reading and writing. An Accessibility Plan is in place and available from our school website. Is there additional support available to help students with SEND with their learning? We have Literacy Intervention; Pastoral Support Manager interventions and peer mentoring. Resources are allocated based on evidence of need and effectiveness. Students with a Statement/EHCP have resources allocated as outlined in their statement or plan. Learning Support Assistants are allocated, where resources allow, to support students in lessons. Staff liaise closely with them to ensure maximum effectiveness. They have a huge range of skills to offer in supporting students directly and indirectly, assisting staff and helping parents/carers. Students with Statements/EHCP’ s will have targets and strategies set by the SEND team in discussion with Wolverhampton SEN Start. Annual Reviews involving the student, parents/carers, subject staff and other professionals evaluate those targets and strategies. The decision is based on evidence of need and impact. What social, before and after school, and other activities are available for students with SEND? of activities to support SEND students including Homework Club, Lunch and Break Time Social Club, Breakfast Club etc. We also run coursework/revision sessions for older students as and when required. SEND Clubs are by invitation only and these are outlined on the termly parents’ newsletter. All children in the school are encouraged to take part in extra activities at break time, lunchtime and after school. Day and residential trips are open to all children and your child’s specific needs can be discussed if they wish to join such a trip. At Aldersley High School we take our pastoral responsibilities seriously. We pride ourselves on providing a high level of student support and guidance. One way we support our students is by assigning them to a form tutor who will (in most cases) remain with them as they progress up the school. This provides continuity and builds a strong relationship between tutor and students. There are additional members of staff who are able to provide pastoral support, these include: Deputy SENCo: A Pastoral Year Head; RSL, Educational Psychologist Counsellor; Learning Support Assistants; and four Designated Safeguarding Leads (DSL). We also have excellent relationships with a number of external agencies, for example: Wolverhampton SEN START; Educational Psychologists, and CAMHS, MASH – for assessments from EP, EWO. Speech & Language Therapy, Occupational Therapy and Physiotherapy services. Who should I contact if I want to find out more about how Aldersley High School supports students with SEND? What should I do if I think my child may have a special educational need or disability? Training is provided to all staff, including teachers and LSAs, as the need arises and there is ongoing training for all staff as well as opportunities to further develop skills. Staff who are new to the school follow an induction programme which includes training and information on SEN.
As a school we can call on support from specialist organisations from within the Local Authority as well as Health and Social Care Services. As a school we can access a range of services including Visual and Hearing Impaired Team and Disability Team. These services are contacted when necessary and appropriate, according to your child’s needs. If you believe your child needs specialist equipment or other facilities please contact Mrs Vernon, Mrs Harris or Mrs Palmer or discuss the issue at the next review/parents evening. 7. The arrangements for consulting parents of children with special educational needs and disabilities about, and involving such parents in, the education of their child. We will support you by having regular communication and a named key worker for your child who will contact you on a regular basis. Learning Plans will be available for you to access and support your children with their learning at home. Students are encouraged to take part in Pupil Voice activities; regularly evaluate their work in lessons; attend review meetings; contribute to target setting and reviewing and reflect on their learning and achievements by completing the student comments section at each review. They are asked to contribute to the completion of the student passport, expressing the main concerns they have that affects their learning. In the first instance contact the subject teacher or your child’s tutor who may refer your concerns to a more senior member of staff if needed. Alternatively please contact our Head of School. The schools complaints procedure is available on the school’s website. Please contact Mrs L Vernon for further information. As a school we can access a range of services including Child and Adolescent Mental Health Service (CAMHS); Social Care; School Nurse Service; Educational Psychology Service; Connexions; Speech and Language Service; Occupational Therapy Service. Specialist SEN teacher service. These services are contacted when necessary and appropriate, according to your child’s needs. If you believe your child needs support from a specialist please contact Mrs Vernon, Mrs Harris or Mrs Palmer or discuss at the next review/parents evening. 11. The contact details of support services for the parents of students with special educational needs and disabilities, including those for arrangements made in accordance with section 32. How will the school prepare and support my child when joining your school or transferring to a new school or post-16 provision? We liaise closely with primary schools and provide additional transition support both before your child starts and afterwards, if it is needed. All children receive advice on careers and are encouraged to apply for Sixth Form or to visit colleges to explore post-16 courses. If additional support is needed this will be put in place. We work closely with Connexions to ensure relevant paperwork is completed for students with Statements/EHCP’s. We have a range of information and guidance activities throughout the year to prepare students for life outside school. Where can I find out about ther services that might be available for our family and my child? We are a statutory service providing impartial information, advice and support to parents and carers of children and young people with special educational needs and other additional needs. The support that you can access from us is free, neutral, confidential and impartial. Providing Sports, Arts, Play and outings for children with Special Needs and Disabilities in Wolverhampton and the surrounding areas.